Adult spider mites have eight legs. Twospotted spider mites can be rusty green, brown, or yellow in warm weather. Overwintering females are red or orange. These mites have two black spots on their back that are visible with a hand lens. The eggs vary from transparent and colorless to opaque pale yellow. The first stage larva is pale green or yellow and has only six legs. Nymphs are similar to adults except smaller. Twospotted spider mites are widely distributed in the United States and feed on over 180 wild, ornamental, vegetable, and fruit plants species. They are less common on woody trees and shrubs than on herbaceous plants and semi-woody shrubs like roses and Buddleja. 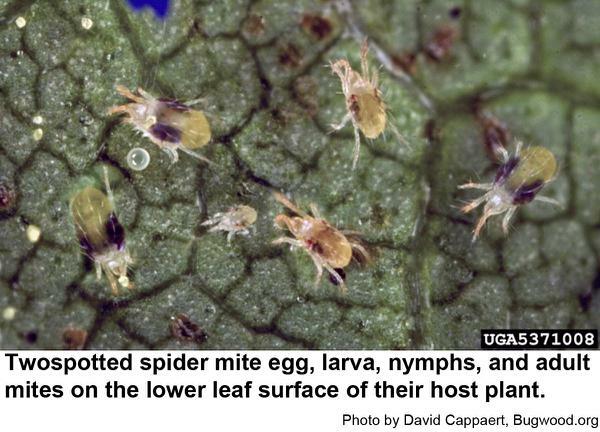 Twospotted spider mites pierce the epidermis of the host plant leaf with their sharp, slender mouthparts. When they extract the sap, the mesophyll tissue of the leaf collapses in the area of the puncture. Soon a chlorotic spot forms at each feeding site. The accumulation of these tiny spots is called stippling. After heavy feeding, an entire plant may become yellow or bronze as the individual spots coalesce. Heavily damaged plants drop damaged leaves and may die. 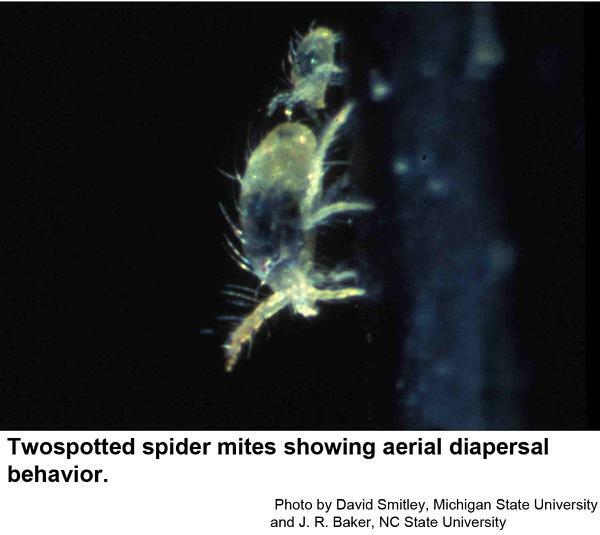 Mites also spin silk webs that can cover leaf surfaces and accumulated feces, exoskeletons, and other debris. Twospotted spider mites on the underside of their host leaf. 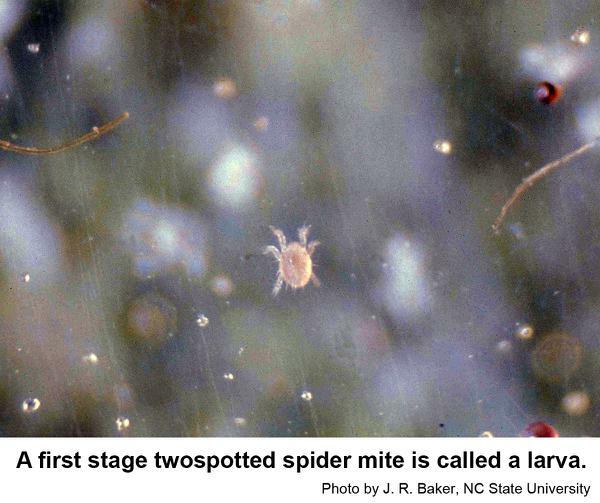 Twospotted spider mite larvae are very small and have only six legs. 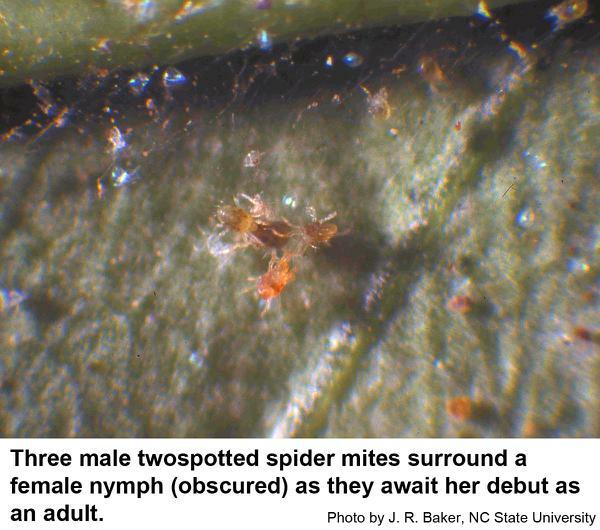 Male twospotted spider mites cluster around a last stage female tritonymph, waiting for her to molt into her adult stage. 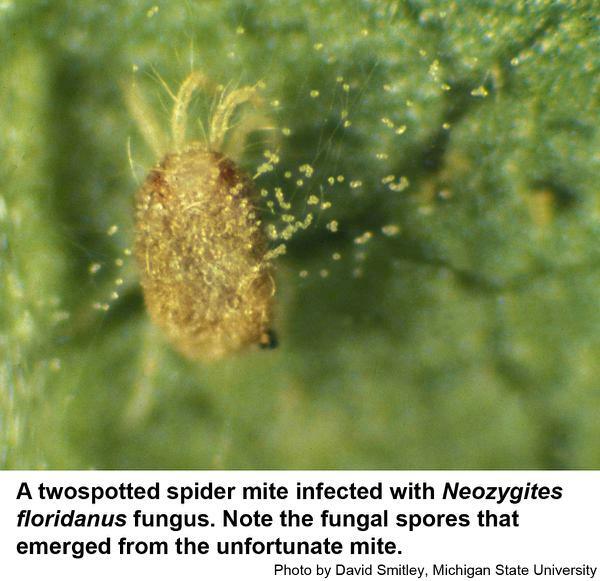 In humid weather, twospotted spider mites are often infected with a parasitic fungus. In hot, dry weather, twospotted spider mites are carried by breezes for considerable distances. 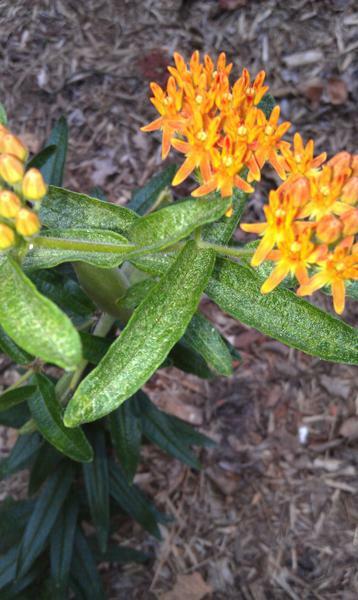 Spider mite stippling damage on milkweed. Spider mite stippling damage on a rose leaf. Eggs are laid singly on the undersides of leaves. Six-legged larvae hatch from the eggs. They develop into eight-legged nymphs, which pass through two nymphal stages. After each larval and nymphal stage there is a resting stage. The adults mate soon after emerging from the last resting stage, and in warm weather the females soon lay eggs. Each female may lay over 100 eggs in her life and up to 19 eggs per day. Development is most rapid during hot, dry weather. A single generation may require as many as 20 or as few as 5 days to reach adulthood and begin producing offspring. Typically twospotted spider mites overwinter in the soil or sheltered places as adults that reemerge in spring. However, with mild winter weather or protected areas like cold frames and greenhosues they may continue to feed and lay eggs at a reduced development rate. 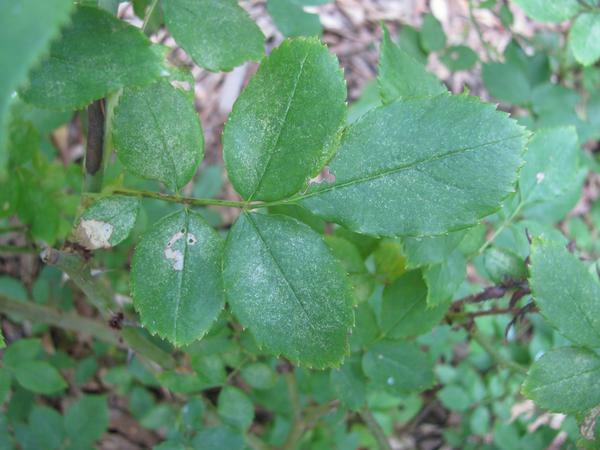 Twospotted spider mites are common on roses, daylilies, hollyhock, marigold, butterfly bush (Buddleja), Solomon's seal, and many other annuals, perrenials, and shrubs. Twospotted spider mites are most active in hot dry weather. Begin monitoring susceptible plants in late May as weather becomes warmer. Look on the undersides of leaves for webbing, eggs, shed skins, and mites. An efficient way to monitor is to beat plant foliage on a paper plate or other white surface. Mite will be easily distinguished from dirt and other debris because they will be moving. Check plants weekly as populations can outbreak very quickly. Throughout the season look for stippling damage on leaves and focus scouting on plants that have been damaged in previous years. Here a marigold leaf is webbed up and damaged by twospotted spider mites. Deciding if control is necessary is difficult because no reliable thresholds are available. In addition, populations are often suppressed by natural enemies such as predatory mites and minute pirate bugs. Therefore decisions must be made base on the presence of mites, whether a particular plant or site has had twospotted spider mite outbreaks in the past, and the value of the plants. A few mites in a cool landscape with complex vegetation may never grow into a damaging population. However, mites on plants in direct sun or surrounded by impervious surfaces or turf may outbreak quickly due to higher temperatures, greater plant stress, and fewer natural enemies. The best cultural control measure for spider mite management is to plant less suseptible plant species in areas that are hot, dusty, or stressful. Nitrogen fertilizer can induce mite outbreaks by making plants more nutritious to feed on. In addition, since twospotted spider mites feed on many weeds and wild plants like black berries and violet, removing these plants from landscapes or from around suseptible plants may reduce infestations. Isolated mite infestations may be pruned from plants. Spider mites have many predators that often keep them under control. These include predatory mites, minute pirate bugs (Orius spp. ), lacewing larvae, lady beetles, and others. Disrupting natural enemies with insecticides is often a cause of spider mite outbreaks. Imidacloprid and other neonicotinoids can also lead to spider mite outbreaks. In many cases mite populations can be reduced with insecticide soap or horticultural oil. 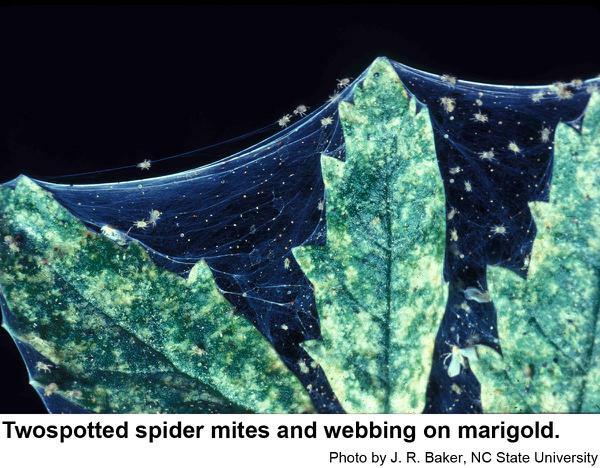 Spider mites are usually found on the underside of leaves. Thorough application of pesticides to the underside of the plant foliage is essential for good control. In hot weather, another application may be suggested 7 to 10 days later, to kill mites that were in the egg and resting stages during the first application. Most insecticides do not control spider mites because mites are not insects. There are many miticides available that target specific aspects of mite physiology. These products are also safer for beneficial insects than broad spectrum insecticides. This can prevent resurgence of mite populations or secondary pest outbreaks that occur when pests that were not killed by insecticides are released from predation because all the natural enemies were killed. Check the North Carolina Agricultural Chemicals Manual for the latest list of products labeled for spider mite management in ornamental landscapes. Common name: twospotted spider mite, scientific name: Tetranychus urticae Koch (Arachnida: Acari: Tetranychidae). Fasulo, T. R. and H.A. Denmark. 2000 (rev. 2009). Entomology & Nematology, FDACS/DPI, EDIS Pub. Number: EENY-150. Role of the entomogenous fungus, Neozygites floridana, in population declines of the twospotted spider mite, Tetranychus urticae, on field corn. Smitley, D. R., G. G. Kennedy and W. M. Brooks. 1986. Entomologia Experimentalis et Applicata 41 (3): 255–264. Spider Mites. Cranshaw, W. S. and D. C. Sclar. 2014. Insect Series, Home and Garden Fact Sheet No. 5.507. Insect and Related Pests of Shrubs. Baker, J. R. ed. 1980. NC Agricultural Extension Service publication AG-189. 199 pp.